The Bidebarrieta Library, built in the French eclectic style, is the work of architect Severino de Achúcarro. 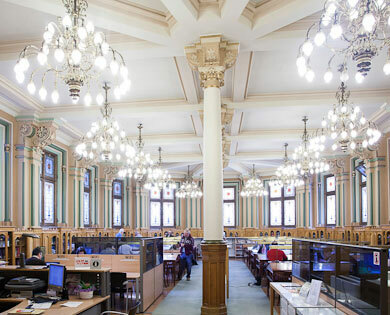 It was built in the late nineteenth century to house the headquarters of the El Sitio company, which was founded in memory of the Auxiliary Corps who defended Bilbao in the sieges on the city during the Carlist Wars. Today the Library is one of the most important cultural centres of the city and houses more than 100,000 books.